Before you read this blog post, we hope you’ll recognize that Pursuit Training is not necessarily recommending Intermittent Fasting—we are hoping to provide you with a bit of information so that you and your healthcare practitioners can decide what is right for you. We do not recommend extreme or fad dieting, we hope you will find a way of eating that enables you to meet your optimal health and reach your fitness goals—no matter what you do, consistency and adherence are keys to success. Simply put, intermittent fasting is a way of eating that defines a given time period as being a period where you fast (don’t eat) and a given period where you do eat. It is not a diet, but rather a way of scheduling your meals. That being said, one of the benefits of intermittent fasting, say people who sing the praises of this strategy is that it can be easy to follow. 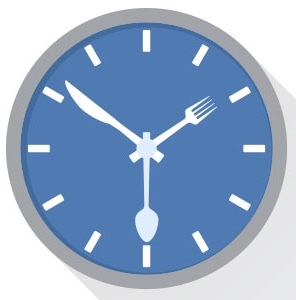 Depending on how you decide to fast, a basic program popularized by leangains.com is daily intermittent fasting, which consists of not eating for 16 hours and having an 8 hour (1pm – 8pm) window where you do eat, could be right for you. This is contrary to how some folks prefer to eat smaller meals more frequently. If you are someone that prefers to graze and snack, then intermittent fasting may be hard for you; if you are someone who would rather save their calories for one or two really large meals and feels satisfied that way, intermittent fasting might be for you. For those interested in building lean muscle mass, you may wish to modify your “fasting hours” so you can eat protein, but restrict carbs. There is only so much protein your body can absorb in one sitting, so having 200 grams of protein in one sitting may not be as beneficial as having 200 grams spread over the day. Again, something to keep in mind when determining whether intermittent fasting is right for you. Intermittent fasting allows your body to be in a fasted state, which allows your body to access stored fat for energy—this is why it is seen as beneficial for those looking to shed unwanted fat. There are weekly and alternate day fasting schedules that are more complicated that the 16:8 split mentioned above. Again, it’s about finding what you can stick to and makes the most sense for your lifestyle and goals. Have you tried or do you adhere to intermittent fasting? What were the results? Share your story with us on Twitter, @PursuitTraining, use #PursuitTraining or #WhatsYours so we can find your tweets.